Whether you're sold on Intel's 9th gen CPUs or not, there are already plenty of boards to choose from and we'll obviously be ramping up our coverage over the next few weeks. 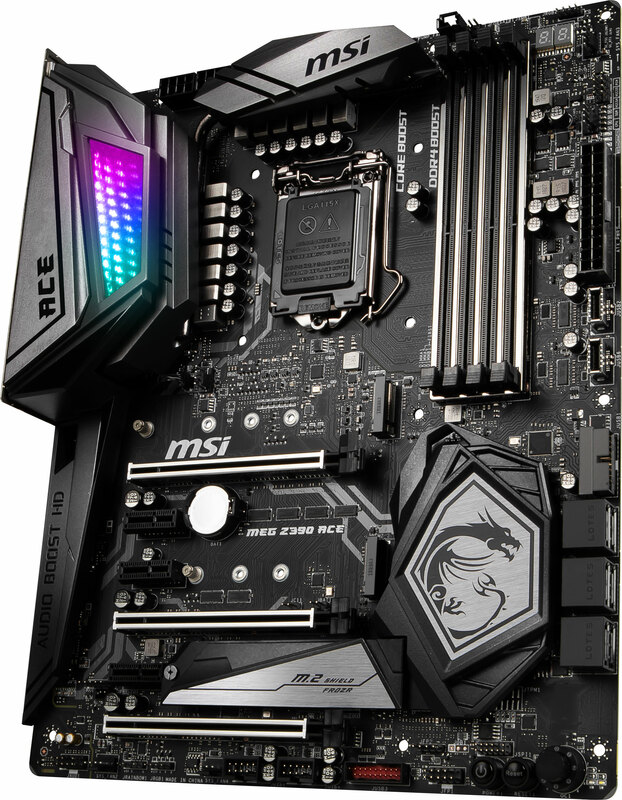 We're starting with something at the premium end with MSI's MEG Z390 Ace. We say premium because this board is loaded with features and coming in at nearly £300, it certainly has a premium price tag. So, what do you get for your cash? Well, for starters, you get the rather tasty product below with its snazzy RGB lighting display, but it's other aspects of the design and features that impressed us the most with this board. 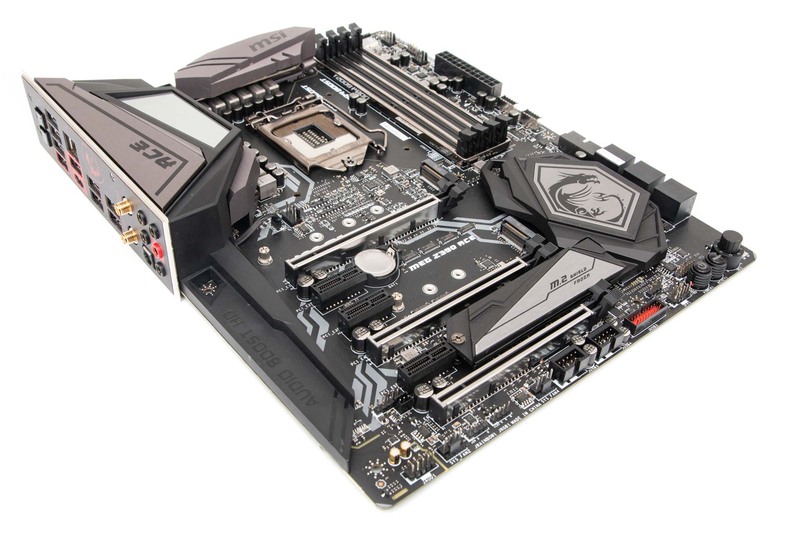 MSI has stepped up its game in a number of areas and not just here, but with a range of its new Z390 motherboards, many of which now include integrated rear I/O shields and new M.2 cooling arrangements, as well as updated software. With the MEG Z390 Ace you get all of that. The raw specifications are impressive, with a13-phase power delivery and trio of M.2 slots. USB 3.1 Gen 2 is here in a big way with two Type-C headers on the PCB for cases that support them - both Z390-powered, plus single ASMedia-powered Type-A and Type-C ports on the rear panel, too. The Z390 chipset adds a further four Type-A USB 3.1 ports here bringing the total to five - the most USB 3.1 Gen 2 ports on a board we've ever seen. A further two USB 2.0 ports bring the total Type-As to a reasonable seven. You get plenty of overclocking and testing tools, with MSI's Game Boost overclocking dial plus LED POST display, power and reset buttons as well as USB BIOS flashback and CMOS clear buttons on the I/O panel, too. 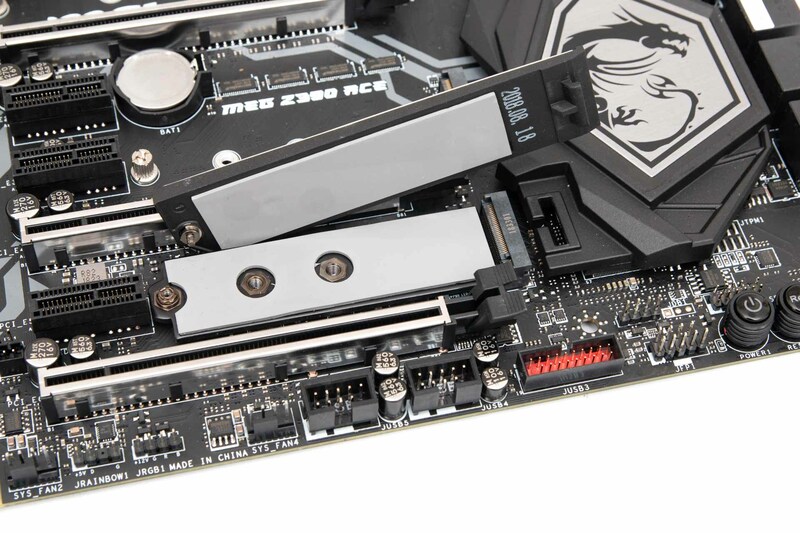 MSI's new M.2 Shield Frozr heatsink is much more elaborate than previous efforts, with a larger top heatsink plus the inclusion of a bottom heatsink, all sandwiched together with thermal pads. The pads make installing your SSD fiddlier, but it gave us the biggest drop in temperature we've ever seen, with our Samsung 960 Evo falling from a load temperature of 76°C without the heatsinks to 52°C - a drop of 24°C thanks to both sides of the SSD being cooled and doubling-up the heatsink arrangement. Of course, you won't be able to use the three M.2 ports and all the SATA ports at the same time as they all share bandwidth and it's also worth noting that the bottom heatsink-equipped M.2 slot is only compatible with PCI-E M.2 SSDs while the top two slots offer both SATA and PCI-E support, although all slots support up to full speed - i.e. PCI-E 3.0 x4. There's plenty to offer with RGB lighting here too with support for 3-pin Corsair lighting hardware such as its Fan Hub, allowing you to sync lighting effects with MSI's Mystic Light software. We should add that controlling Corsair's Vengeance RGB Pro memory worked fine with the software on this board, too. The main lighting feature is the stacked lighting array on the I/O shield. It looks fantastic and while it's not worth the board's premium on its own, it's quite funky nonetheless with plenty of lighting effects to choose from to apply to the rows of RGB LEDs. As usual you get 4-pin and 3-pin addressable LED headers as well. The rear I/O panel is fairly standard with a single Killer LAN port (perhaps slightly disappointing not to see an Intel port here) plus WiFi aerial connectors and the usual six audio outputs for the onboard Realtek ALC1220 audio. For the asking price, the accessory pack is also slightly below par with just a desktop WiFi aerial and RGB cables being the most notable inclusions.